A very special Torah Completion & Celebration. Mazal Tov Naples! On March 31st, the Naples Chabad community welcomed the new Unity Torah home. Commissioned a year ago by Patricia Adkins and her family, the Torah came home with much pomp and a lot of ceremony home to be complete by the scribe, Rabbi Klein. 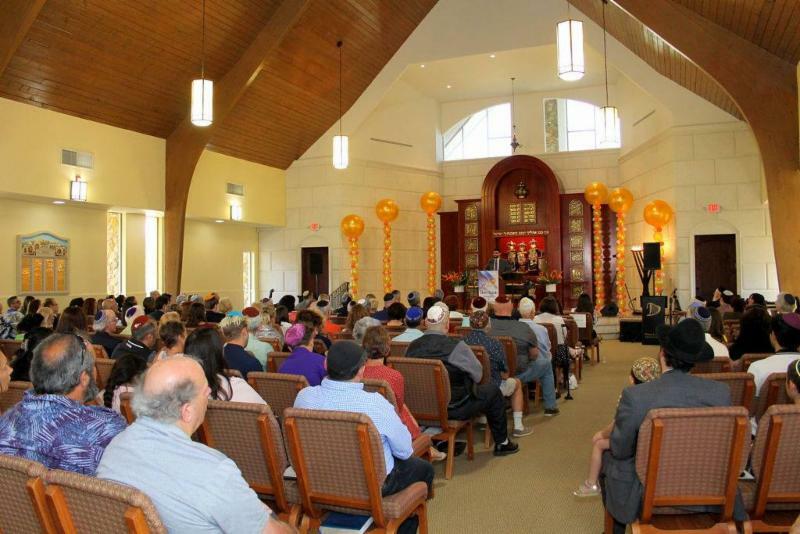 Close to 300 people came out and joined the festivities celebrating the completion of a very special Torah Scroll - a Torah Scroll written as a testament to "the spirit of unity" of the greater Naples, Collier County and Marco Island communities. The joyous occasion was accompanied by Cantor Yaakov Lemmer who thrilled the large crowd with his powerful voice and choice of music. If Moses would have arrived at this Torah celebration, on March 31, 2019, he would be puzzled at the cars in the parking lot, the cell phones in every pocket, the lights in the sanctuary...but he would see this Torah, and he would know exactly what it is; he would hear the blessings over the Torah, and he would know exactly what those are- the more things change, the more some things remain the same. Three thousand years after Moses came down with the Torah, it is still the same, word for word, letter for letter. What a gift for us all, in this ever-changing world! This Shabbat, as we welcome the Unity Torah to our service, "In the spirit of our ancient tradition, which unites and sanctifies the House of Israel in all lands and ages,” we offer the opportunity to come and enjoy whatever personal experiences Chabad Naples offers. Thank you all for participating and celebrating this gift with us! What a lovely celebration! Many thanks to Pat Adkins. May her gift be the source of many blessings to the Adkins family and to our entire Chabad family!